Falling in love with wine and its very particular world and joining the Cordon Bleu's Wine and Management programme was not something I had planned. After a business-oriented Bachelor’s degree in International Relations and Politics, I worked for two years for the Foreign Office at the British Consulate General in Rio de Janeiro. I came to Paris in January 2013 to spend six months in the city before moving to London. To make the most of my time in Paris I started taking evening courses in wine tasting - I had started appreciating drinking wine a few years before but knew very little about it. Within two months I had fallen in love with the world of wine and gastronomy and this very French art de vivre one only discovers by living here. I decided to give my life and career a new direction and apply to Le Cordon Bleu's Wine and Management Programme. I wasn't sure where this would lead me professionally but I knew I taking my best decision so far in life. I wasn't wrong. Sharing. It seems utterly complicated to pick one from the endless memories and adventures we cumulated throughout such an amazing year, but when I think of it, it all comes back to sharing. I believe that great food and wines, shared with people who are dear to you or even people you have just met, are one of the greatest pleasures life can offer. Our everyday life in school; our trips to wine regions and internships; our pints at the school pub and little gatherings to taste wines together - those were all moments of shared happiness and personal development. I have met amazing fellow students, as well as great professionals of the world of wine. Everything they shared with me and all that I was able to share with them, be it ideas, knowledge, moments or bottles, those are my favourite memories of such a magical year spent at Le Cordon Bleu. Since graduating from Le Cordon Bleu I have been working with different facets of the world of wine - I have set up my own company, Vinea, to organise and host wine tastings and dinners for a mostly foreign clientele, as well as organising trips and visits to wine producers. 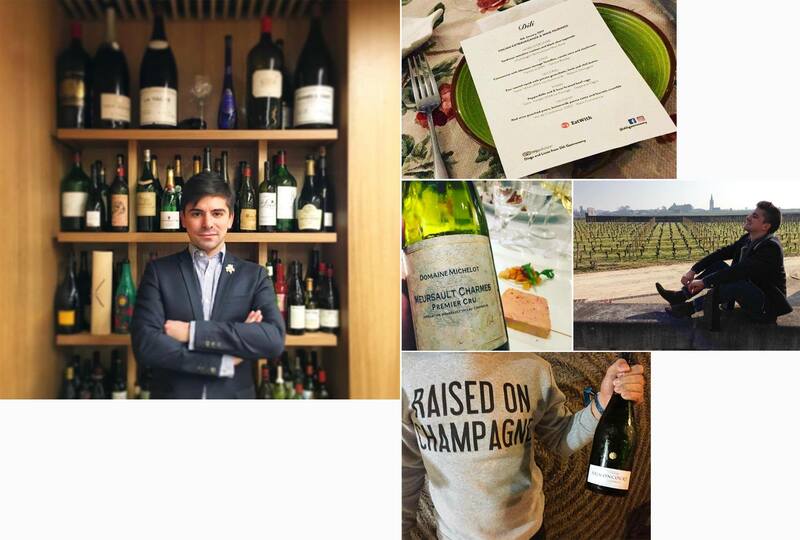 I have joined the Brimoncourt Champagne house in April 2015 as exports developer and brand ambassador, having been globally responsible for the house’s entry in the Brazilian market (December 2015), as well as being responsible for representing Brimoncourt at several high-profile events in Paris and abroad. More recently I have taken part in our export activities in Portugal and the UK. I have recently launched a new business called Dili Gastronomy: a private dining concept, which proposes gourmet dinner menus presented with wine pairings in a charming apartment in Paris 7ème. All our menus are composed of 4 to 6 courses, each paired with selected wines and presented by a chef and Sommelier duo: my business partner Lizzie Kwee, cuisine chef, and myself, both trained by Le Cordon Bleu Paris. Lizzie’s husband, Christophe Carré, cuisine and pastry chef also works with us, bringing in his expertise in pâtisserie. Making the most of all the opportunities they will have to meet other professionals. Throughout our Le Cordon Bleu year we are lucky to meet many professionals from the wine and gastronomy world. Being such a small and rather secretive world, I believe students should put a lot of effort in networking and establishing relationships with the people they will meet. Personally, I had the chance to meet the best sommeliers in France, great wine producers and several other professionals - the relationships I've built have helped me immensely after I graduated from Le Cordon Bleu. Besides that, students should share as often as possible knowledge and great moments with their fellow classmates - Le Cordon Bleu is also all about living a year (or a few!) they shall never forget. I am still in France - it has been four years now and I'm glad I've stayed. Since graduation, back in 2014, I have been able to carry on travelling around the country and discovering its fabulous regions and different culinary habits. I have been able to blossom professionally in my new career and feel particularly proud of the work I have done with Champagne Brimoncourt so far. My roots have grown deep into French soil, I have built great friendships and Paris has become my third and current home. I intend to stay in France and carry on working on my current projects. Working for Champagne Brimoncourt has been a great experience and there's still a lot to build together. There's a lot of work to be put into Dili Gastronomy, and hope we'll build a brand that will showcase France at its best: l'art de vivre, excellence, wine, gastronomy, elegance, and, of course, sharing.